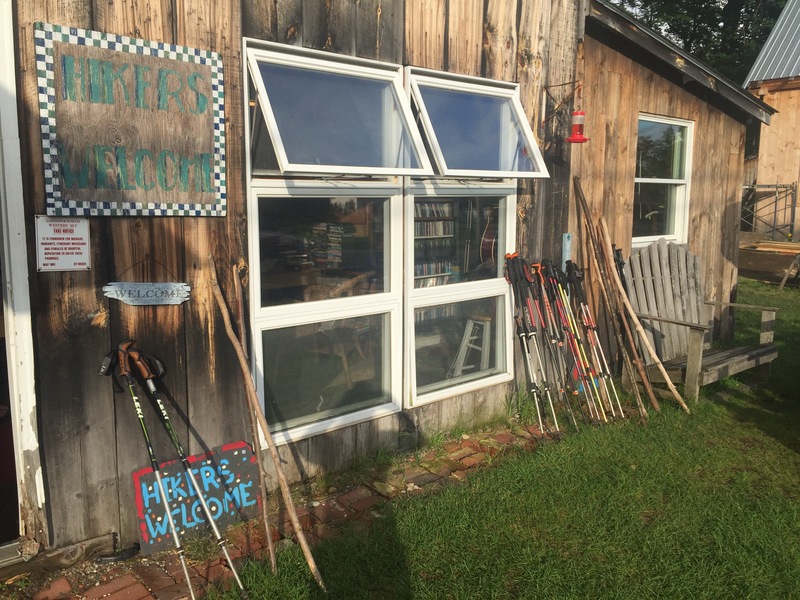 We’ve spent the last two weeks traversing the final miles of Vermont and the first half of New Hampshire. It’s been mountain summer days full of pie, ice cream, raspberries, fireworks, and friends. But the party is about to take a turn as we enter what is known as the hardest part of the AT. Stepping back onto the trail was much more difficult than expected. 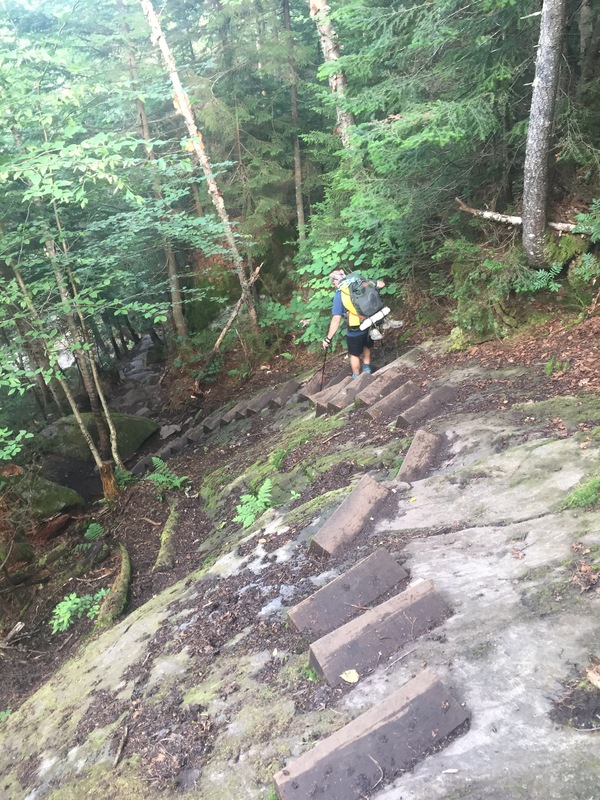 We thought our 2 week hiatus from the trail would make us stronger than ever, but we were met with much resistance from our bodies and minds, which had become accustomed to the whole “sitting” and “driving places” thing. 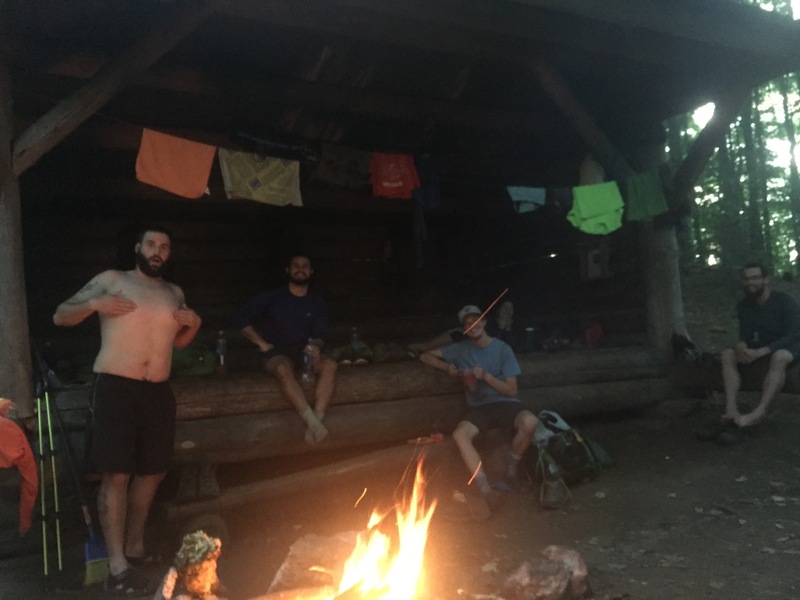 That first mountain kicked our butts, and we felt like it was our first day on the trail! 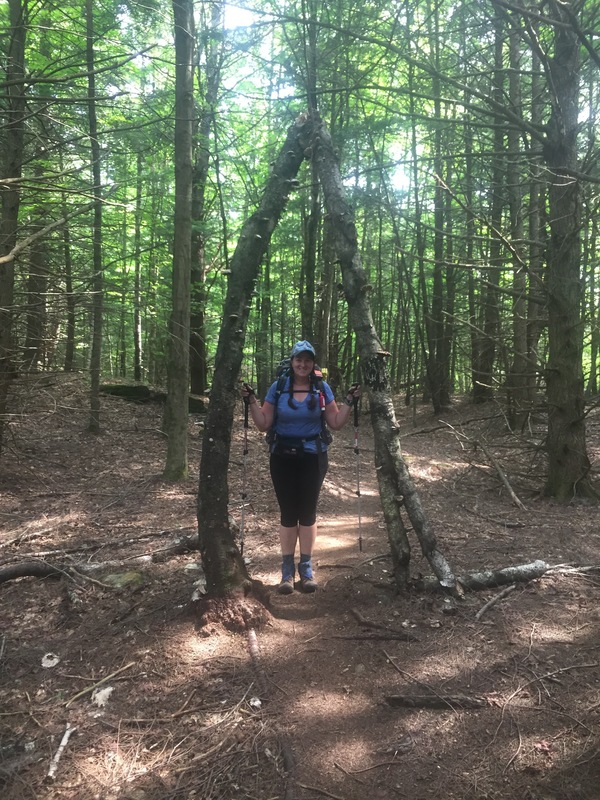 By the time we got to where the Appalachian Trail and the Vermont Long Trail split we were questioning why we had ever left civilization. 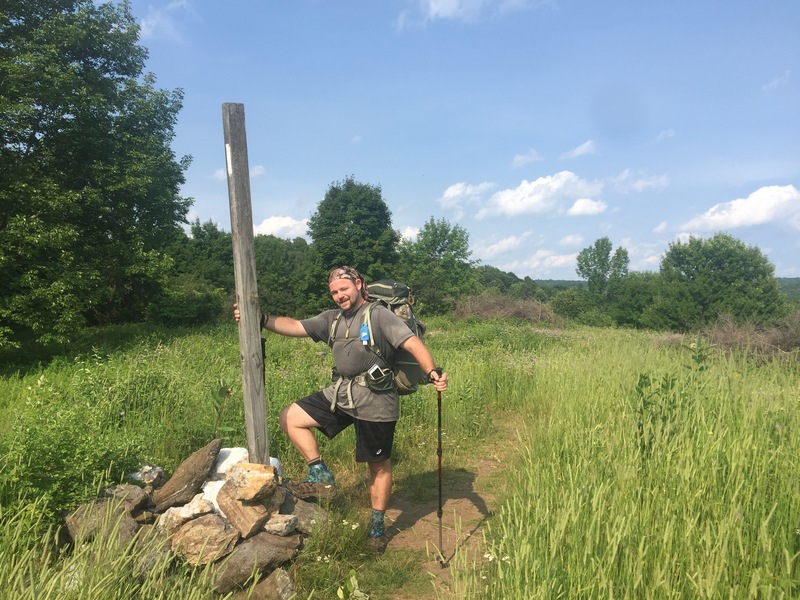 But even though the urge to turn back to Rutland was strong, we agreed to give it a week to see if our trail legs and brains would come back. 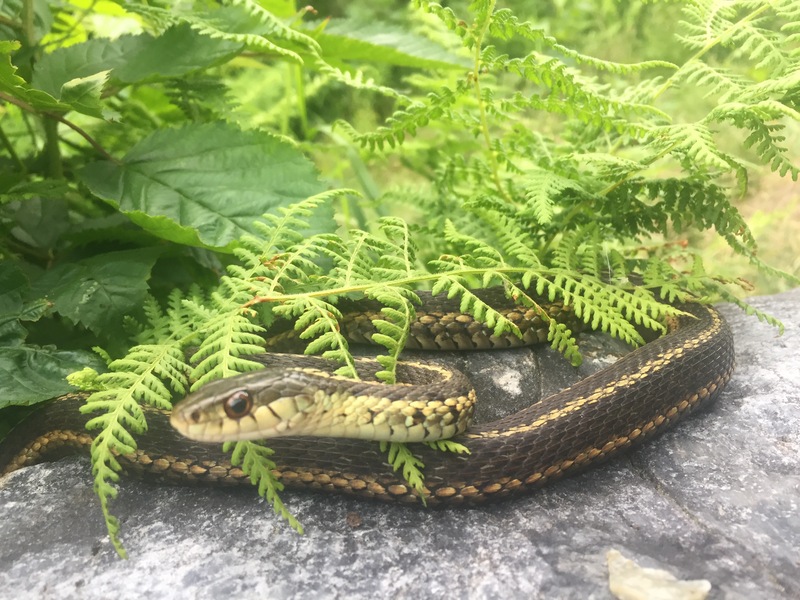 The highlight of the day came around lunchtime when, while sitting on a boulder, a snake slithered up to curl up right next to us! It didn’t seem to care about us or be afraid of us at all, although we couldn’t say the same. If snakes could talk it might have said, “I’ve ressssserved thissss boulder for ssssun basssssking today.” ? 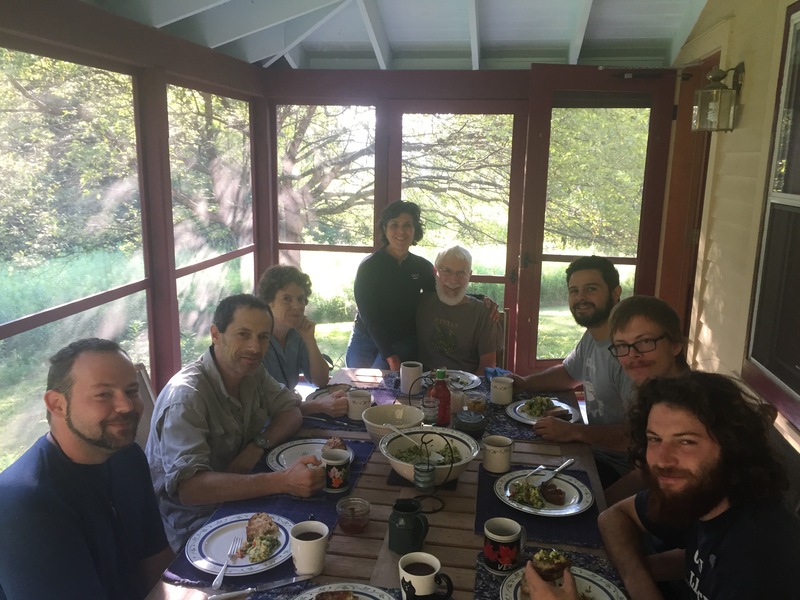 The next morning began with the introduction to our new trail family- Rambo (a section hiker celebrating his RN program completion), Jaws (a continental flip-flopper who had recently graduated from the Israeli army), and his parents, Papa Jaws and Mama Jaws. Starting off with some comraderie made the hiking feel better. Add in a little sun and some awesome views, and we fell right back into the groove! We stopped for lunch at The Lookout, a cabin with a fire tower on top. The 360 degree, panoramic views were a feast for our eyes, and the granola and peanut butter were a feast for our bellies! On top of the fire tower we could see an impending storm rolling in, so we decided to wait out the rain in the cabin. We were joined by a few Southbounders who we enjoyed swapping info with about what was coming ahead. 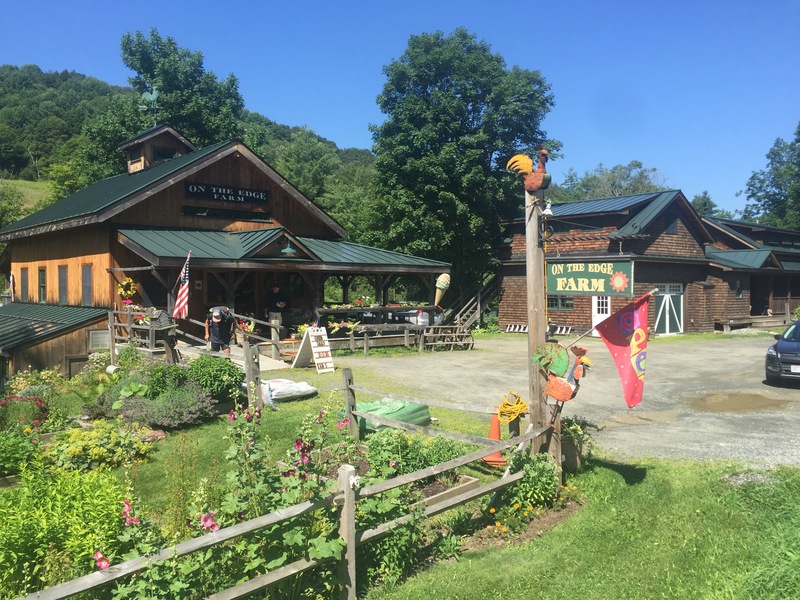 They informed us about a roadside farm stand that we would arrive at in the morning, and hinted at the availability of homemade pies! Pie for breakfast? That’s all the motivation we needed ? 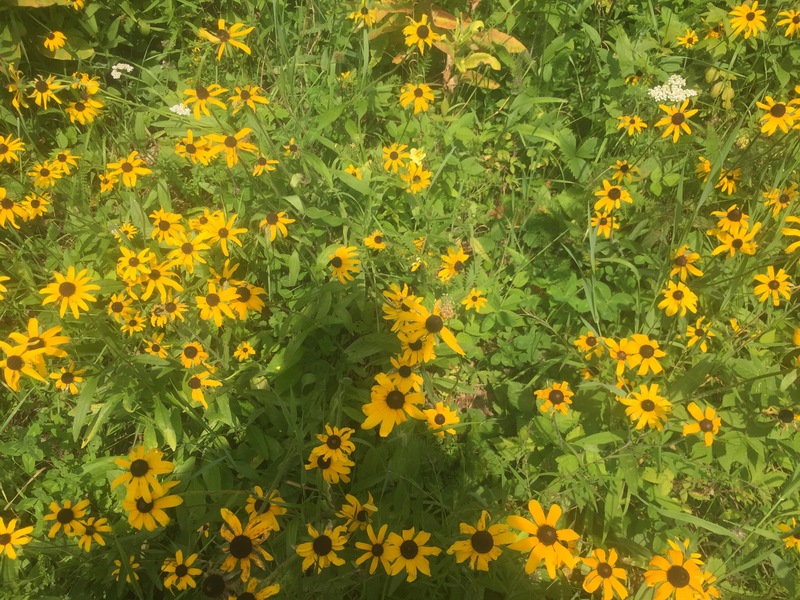 The next day was how I’ve always imagined a mountain summer day to be – good people and laughs, ice creams, sodas, pie, and that yellow/orange golden glow on a dirt road just before the sun goes down. 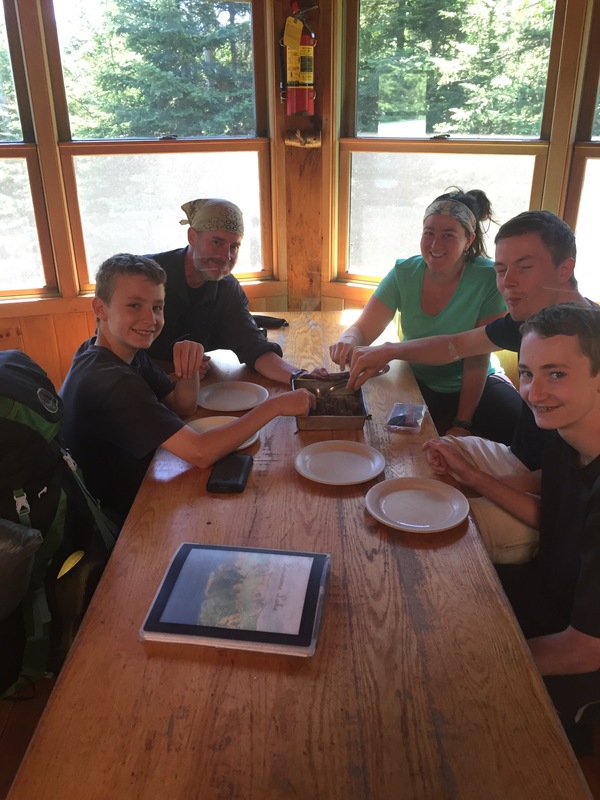 We started the morning sharing trail stories with our Trail family over breakfast over oatmeals and instant coffees. The first 4 miles passed pretty quickly through pine forests, the sun glinting through the trees. 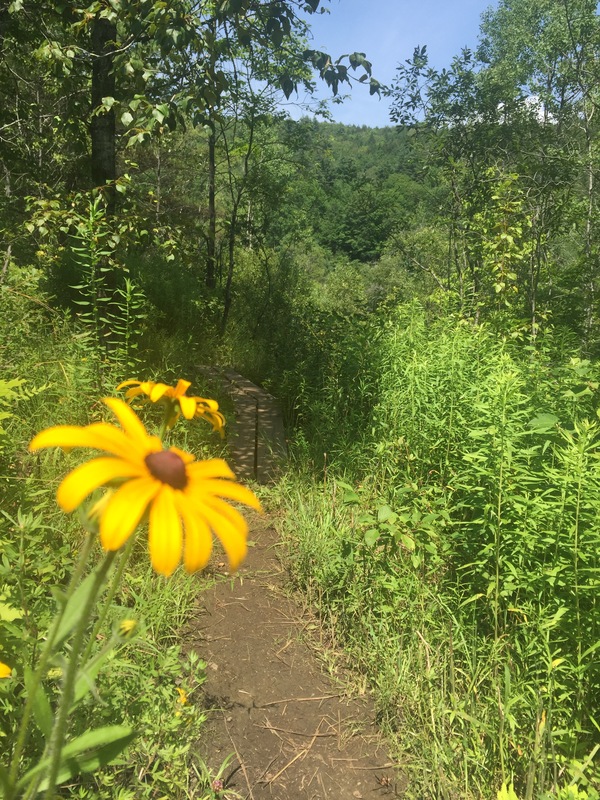 The trail started to become noticeably crowded, as Southbounders and Northbounders alike were out on such a beautiful hiking day. 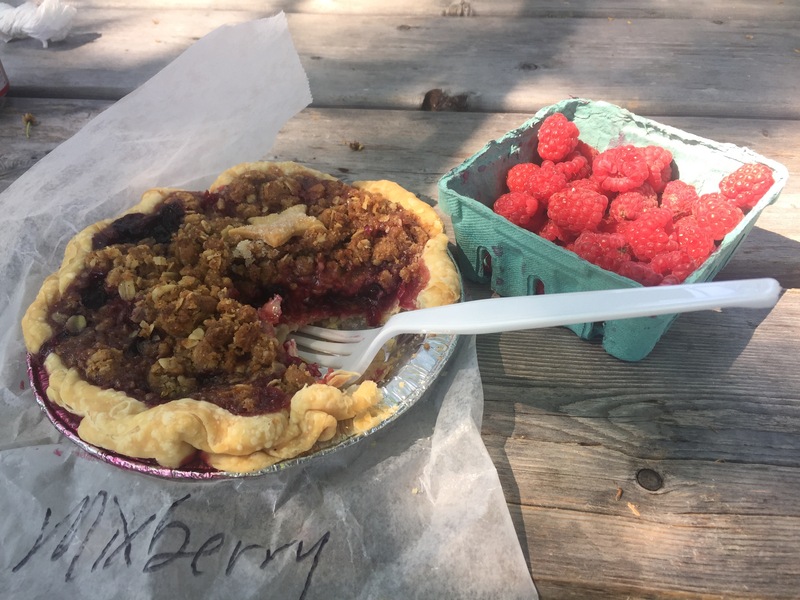 The Edge of the Farm market was the perfect spot for second breakfast…fresh raspberries, a mixed berry pie, and fresh boiled eggs in the shade. We got to hang out with our new friends and even ran into Breeze, who we met all the way back in NJ! It’s amazing how even though we took a good chunk of time off the trail, we are still running into hikers we’ve met. 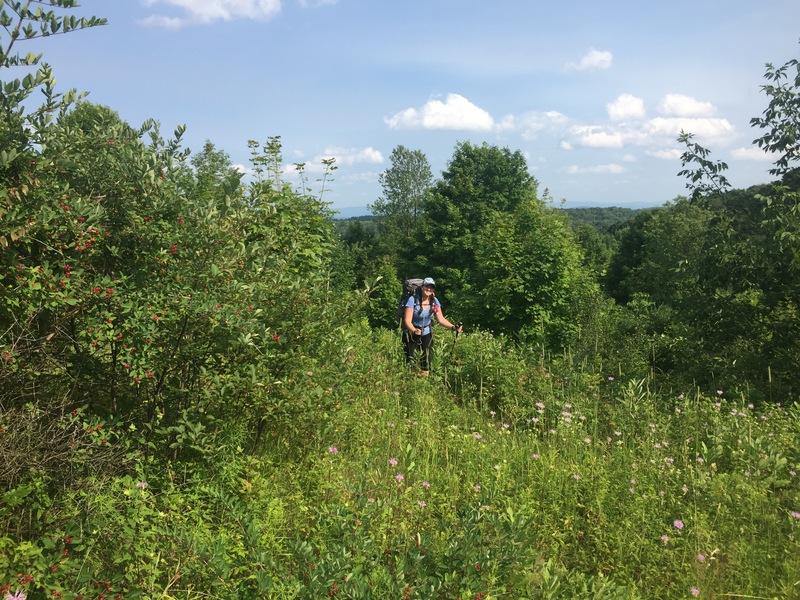 The terrain was constant ups and downs, muddy swampy ponds, and wild raspberry bushes…a nicely difficult last day in Vermont. But we were rewarded in the evening with a second roadside market where we were able to snag some sodas and ice cream before being ushered out the door. Guess the restaurant was expecting their first patrons of the night and didn’t need us dirty, smelly hikers hanging around! The Thistle Hill Shelter was full of Southbounders when we arrived, but we didn’t mind setting up the tent on such a picturesque summer afternoon. We dipped our heads under a little waterfall and enjoyed dinner by the fire, trading more upcoming intel with the SOBO’s. We must have missed some kind of memo because when we woke up at 7am everyone was already gone! We were joined for breakfast by Breeze and Glove, and we all discussed making it to Hanover, NH by the end of the day. Another beautiful day, walking through delicious smelling pine forests, wildflower sprinkled meadows, tall forests that made us feel like ants walking among grasses, and open deciduous forests straight out of Jurassic Park! 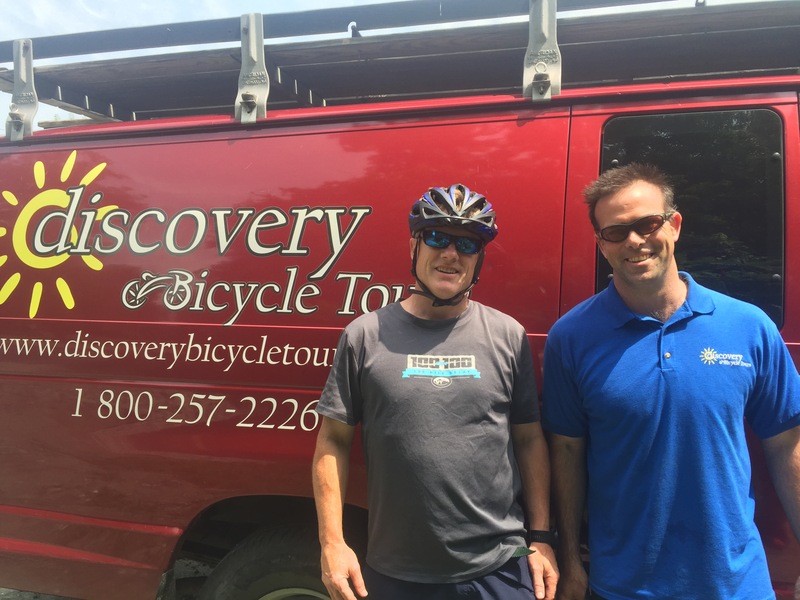 We were reminded of Trail Angel kindness at Rt 14 when we were offered bananas and crackers by 2 bicycle tour guides, Eric and Chris. 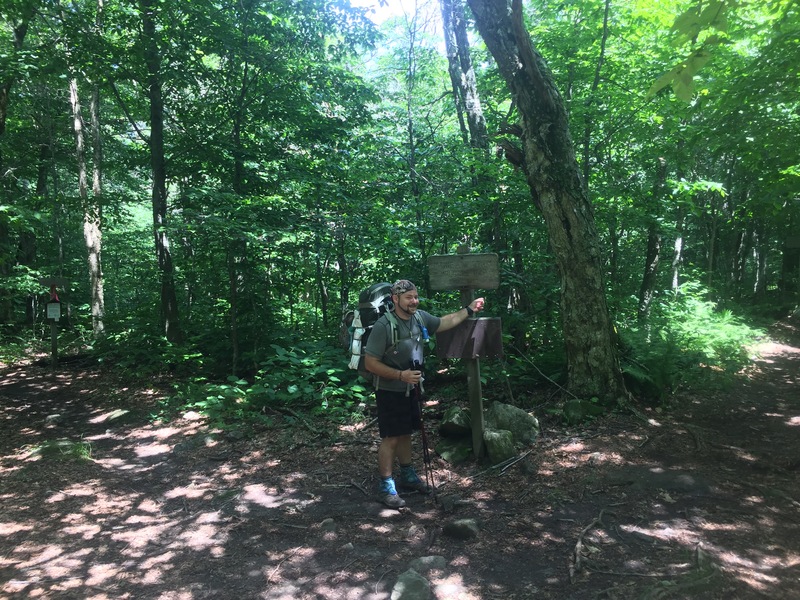 As we chatted, we learned that one of the guides had completed his thru-hike of the AT a few years ago, so we got to hear his story and insights. 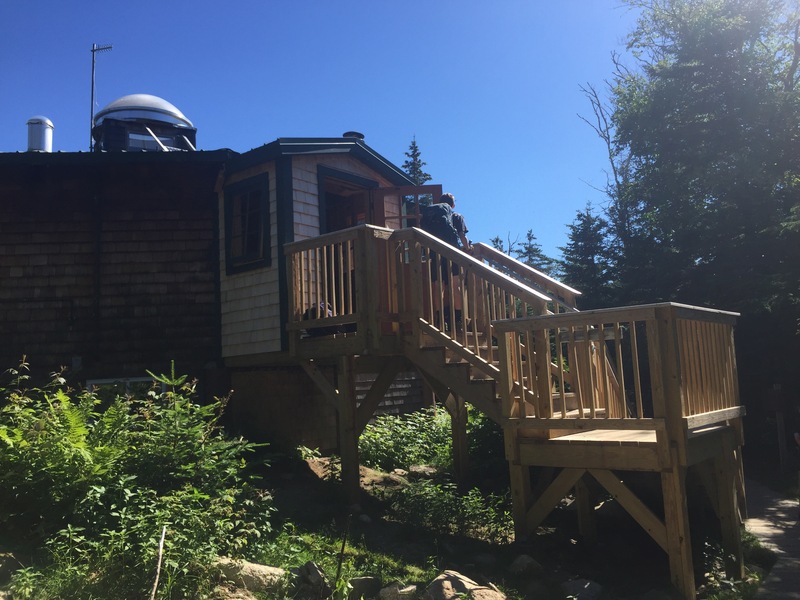 We crossed the “Jumping Bridge” and got to Linda’s Porch, where another Trail Angel, Linda, kindly offered us comfy chairs to sit on, sodas, coffee, and muffins. Chris even got a dose of boldness and decided to partake in the AT tradition of jumping off the bridge, a 30-foot plunge into the refreshing waters below! 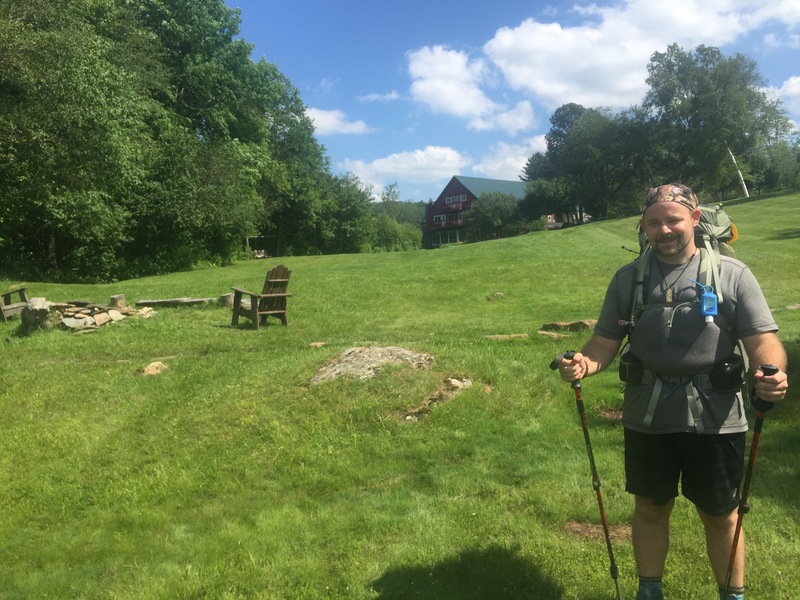 We booked up the remaining “hill” and flew through mosquito-infested woods until we reached the Norwich, VT. 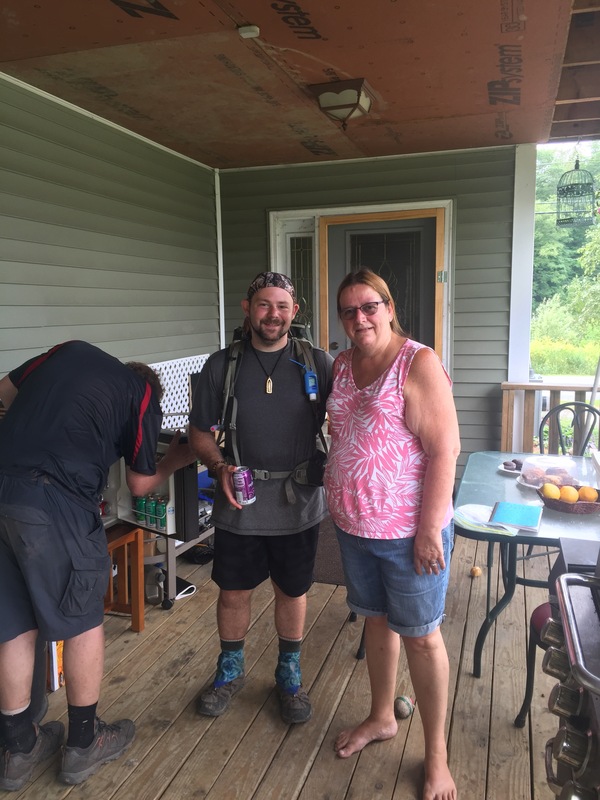 Even though we hadn’t crossed the state border, we decided not to bypass an opportunity to stay with yet another local Trail Angel, Betsy, who opens her home to thru-hikers every night! We were joined by Jaws, Papa Jaws, Mama Jaws, Glove, and Rambo, and enjoyed an evening eating cheap pizza slices and watching fireworks. 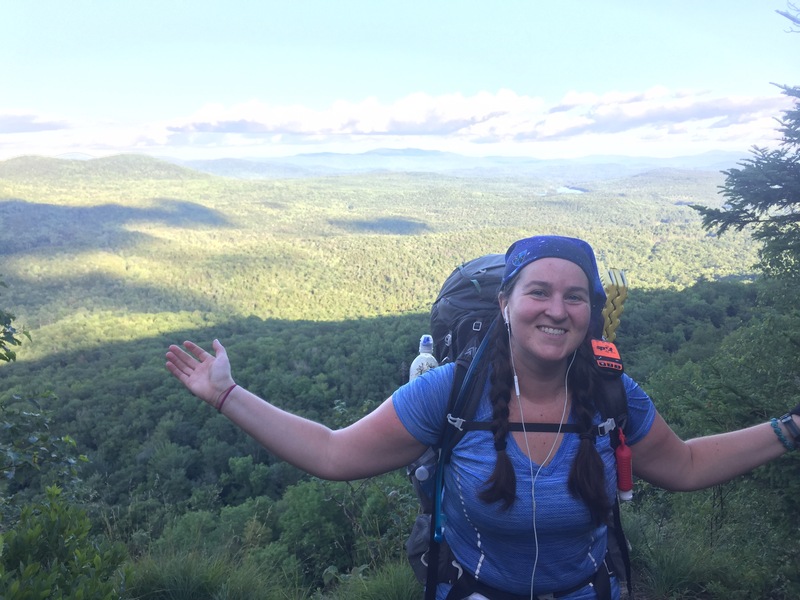 Instead of paying cash for the overnight, Betsy compelled us all to “pay it forward,” and either give back the kindness to other hikers on the trail or in life. Needless to say we were very touched by her story and her generosity! 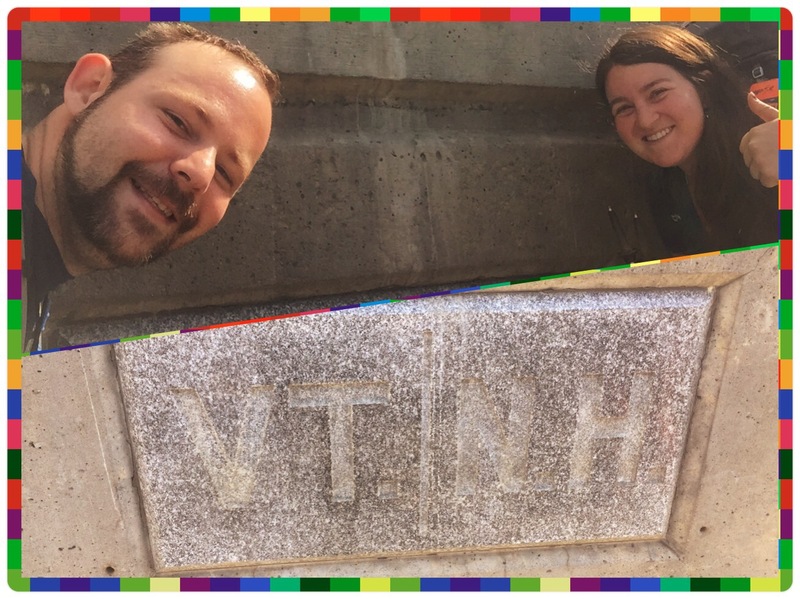 Finally we were into New Hampshire!!! Only a few miles down the road the next morning brought us into our 8th state on the AT. The town of Hanover is home to Dartmouth College, and the town was busy with the hustle and bustle of summer ongoings. Along with Glove, we got a ride to the local grocery store and EMS outfitter. Chris got himself a new pair of boots while I opted for a warmer jacket for the upcoming northern mountains. 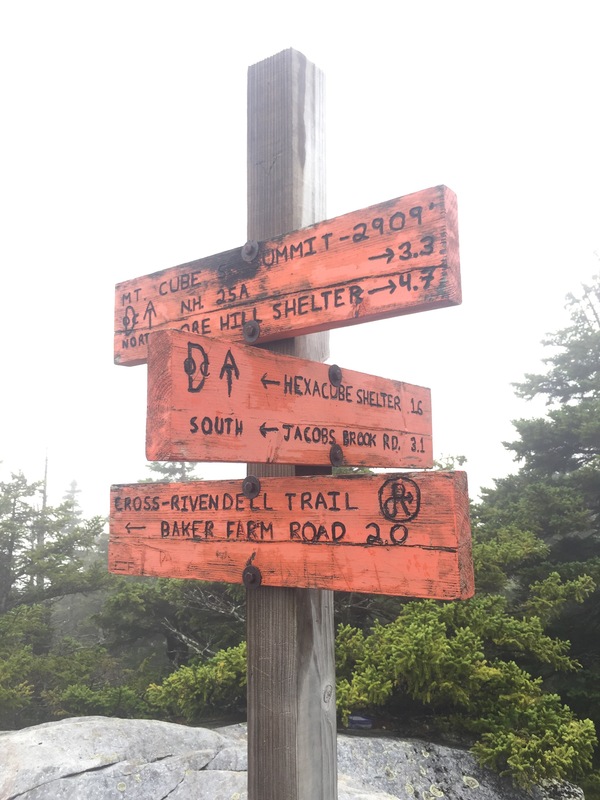 Our trail Angel driver was a “Triple Crowner,” meaning he’s hiked the AT (Appalachian Trail), the PCT (Pacific Crest Trail), and the CDT (Continental Divide Trail)! 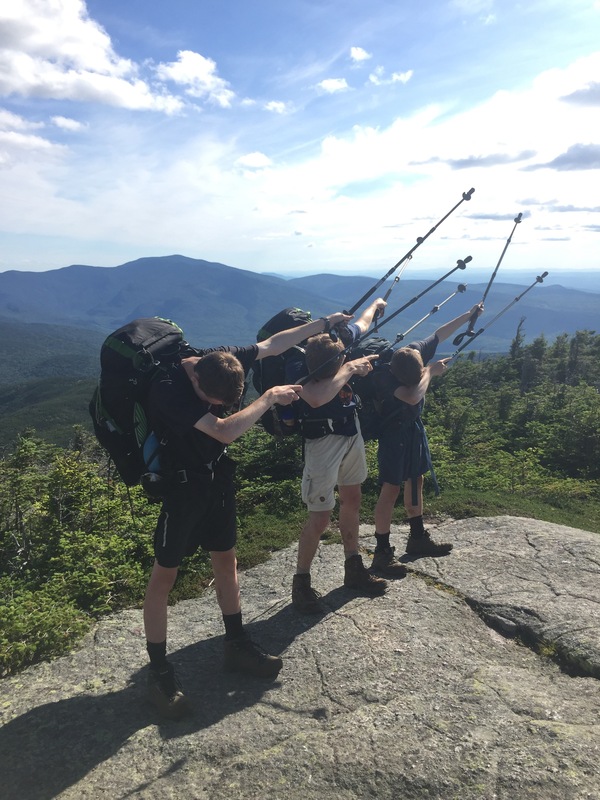 That’s a lot of hiking!! 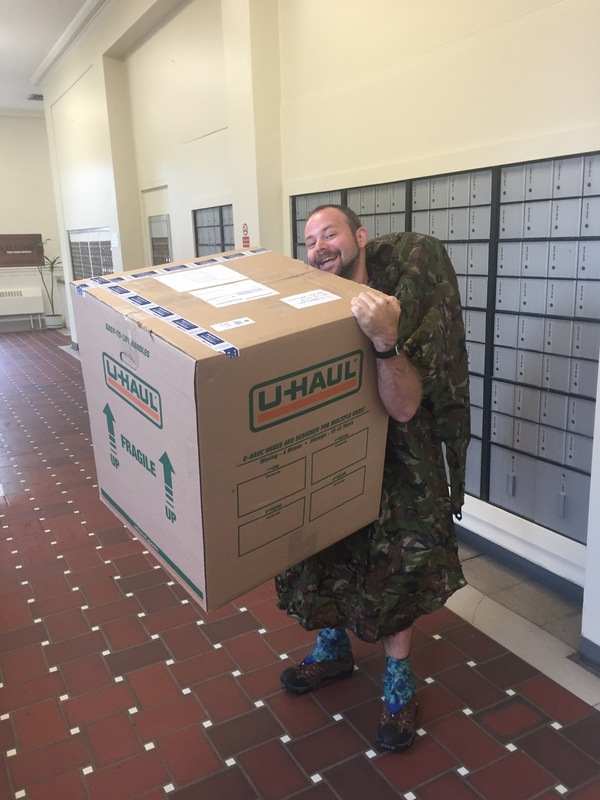 The Post Office was our first stop the next morning, and we were treated to a lovely surprise…Packrat! We had parted ways with her way back in Massachusetts, so we had a lot of catching up to do. Fortunately we decided to chat over Thai food, so that’s a win-win all around ? 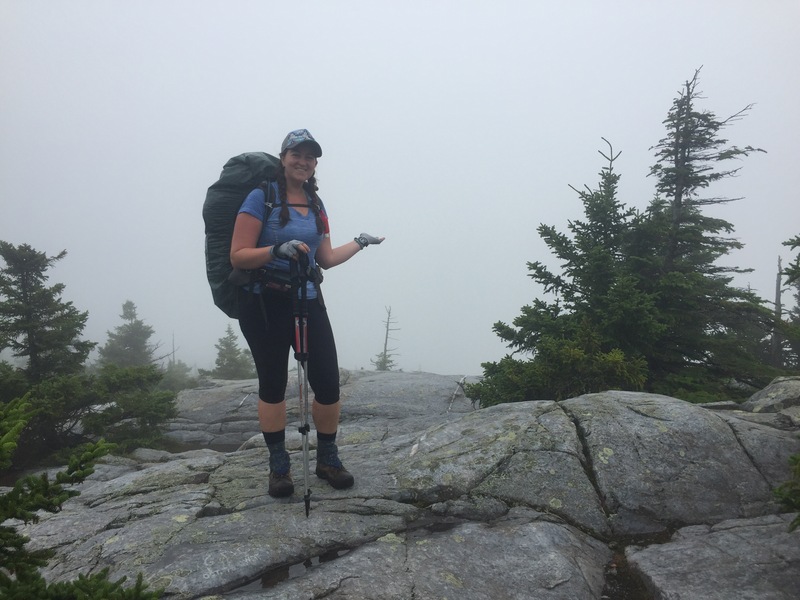 We waited out the bad rainy weather before heading back on the trail for a short 17-mile jaunt up the mountains of New Hampshire. But it seems though the terrain is getting harder, the views are getting better! 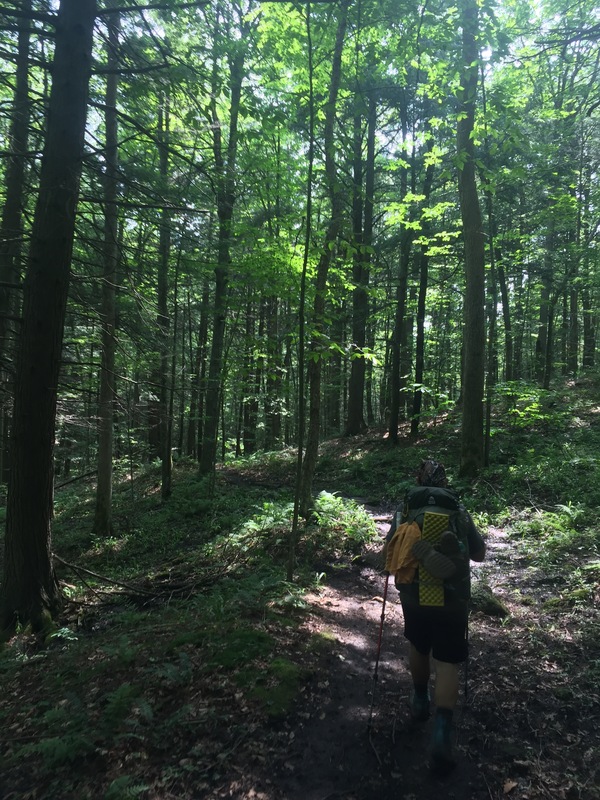 Since we started our Flip-Flop hike in West Virginia, we haven’t seen actual mountains yet. No more! Here there be mountains! 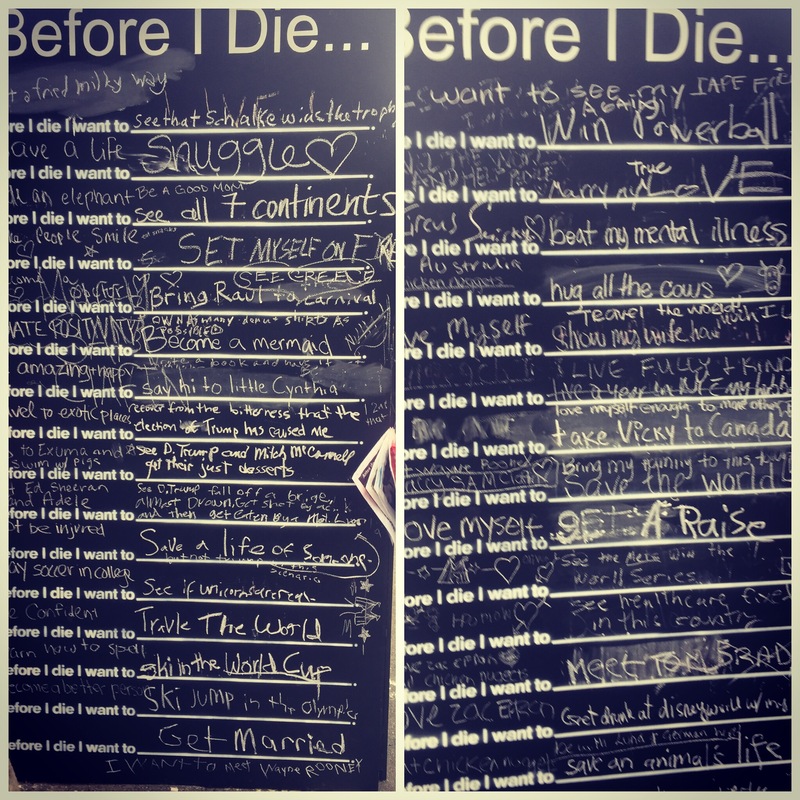 NH has a pretty intense state motto: Live Free or Die. True to its intensity, the mountains didn’t waste any time in getting tough. We headed up a pretty vertical climb, Mount Smarts, which took the better half of the morning. 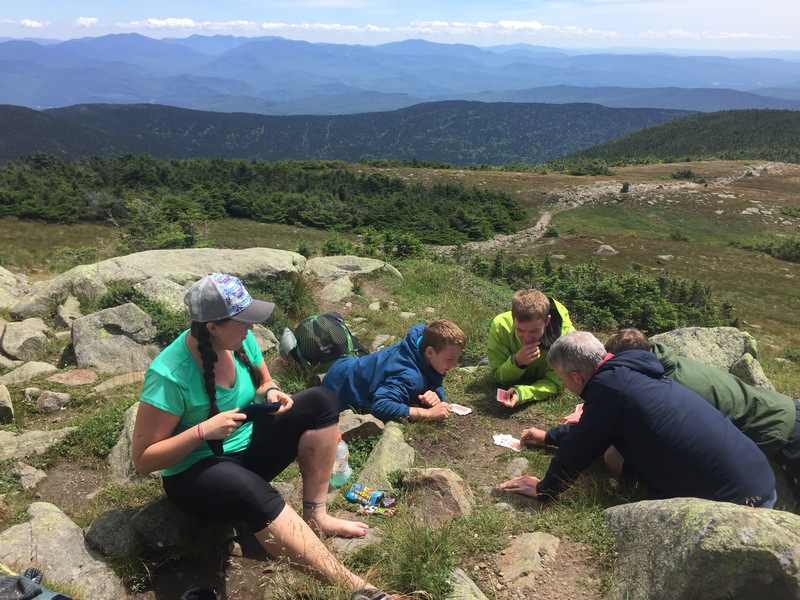 But we were treated to a fire tower at the top, which once climbed, showed us our upcoming challenges of the White Mountains, towering up to the clouds, so unassuming with their perpetual calmness. Halfway up the next mountain was the Hexacuba Shelter, a uniquely six-sided yurt. Even the privy touted a 5-sided pentagon shape! We were joined by Second Dinner, a personal trainer, and The Rock, a physics student from Germany. We debated for a while about the best way to fit 4 sleeping bags into the 6-sided shelter. After a long day it seems that brain cells don’t like to work before dinner ? We awoke to rain, rain, rain. Misty, foggy, drippy, wet trail for our summit of Mount Cube. And at the top…an amazing view! I assume. We never saw more than 20 feet in front of our feet since we were surrounded by clouds. But of course, rain means cooler temps and no bugs so we can’t complain too much! 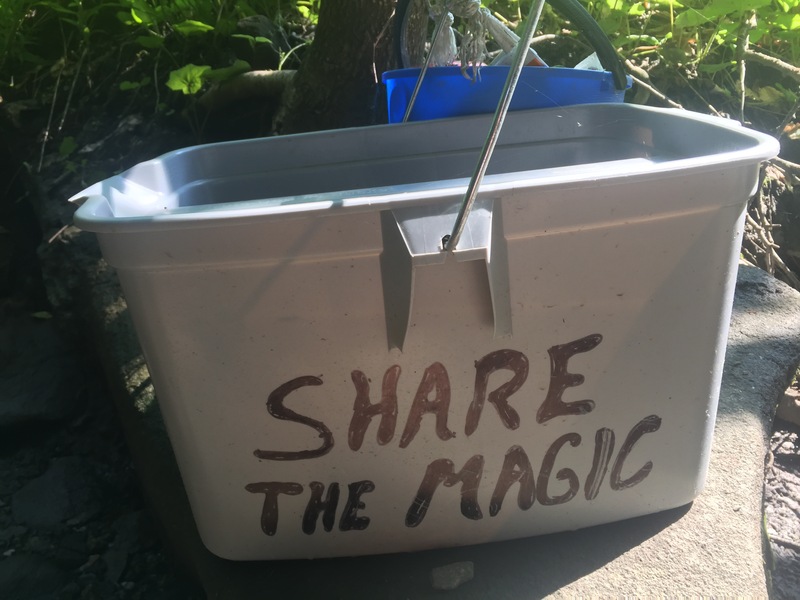 All day, Southbounders were passing us with rumors of a mystical man in the woods who would make eggs for hikers. Chris, The Rock, and I were spurred on by the thought of finding this mythical man, even the slippery rocks couldn’t slow us down. 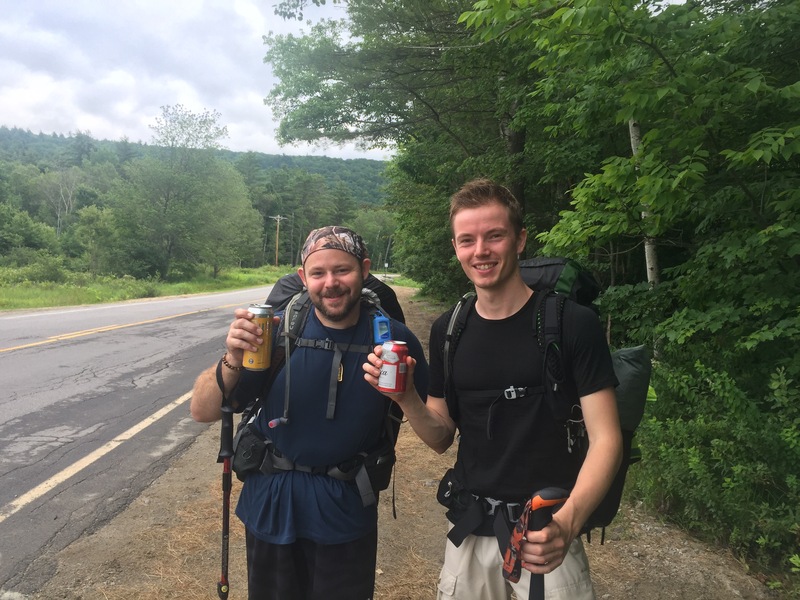 Except for beer…trail magic beer apparently slows us down. 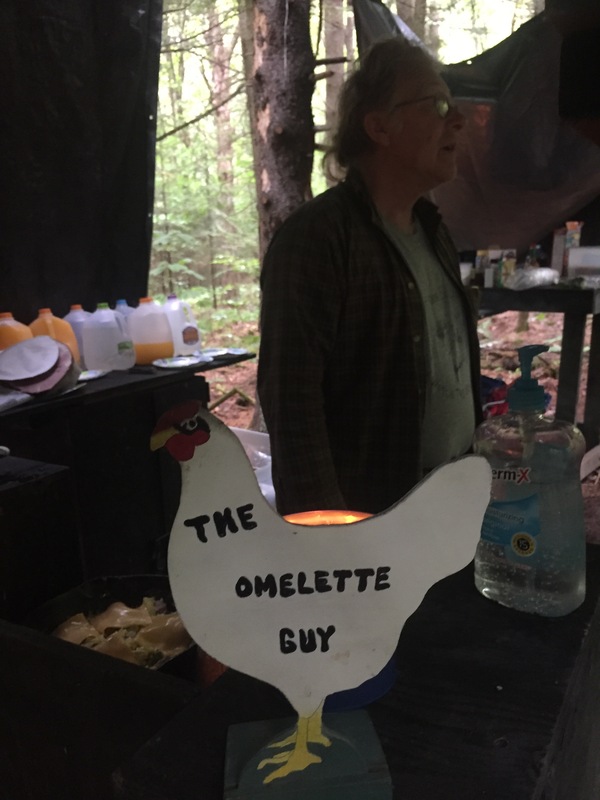 And then, 7 miles into the day (perfect t time for First Lunch), there he was…the Omelette Guy! 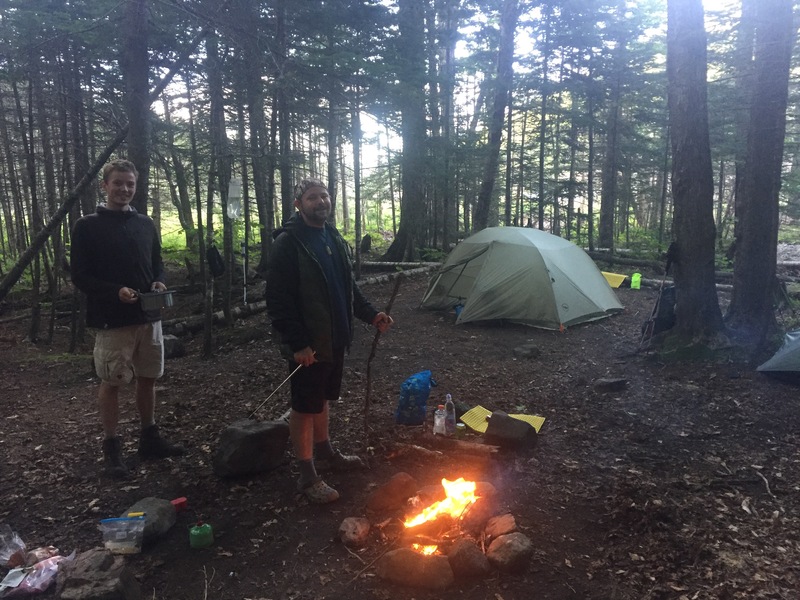 He was cooking up dozens of eggs with ham, onions, and peppers, offeing homemade muffins, coffee, and bananas to all passing by as part of his Trail Magic. The food was just egg-cellent, I’m not even yolk-ing. Ok, ok, omlette-ing this pun go ? 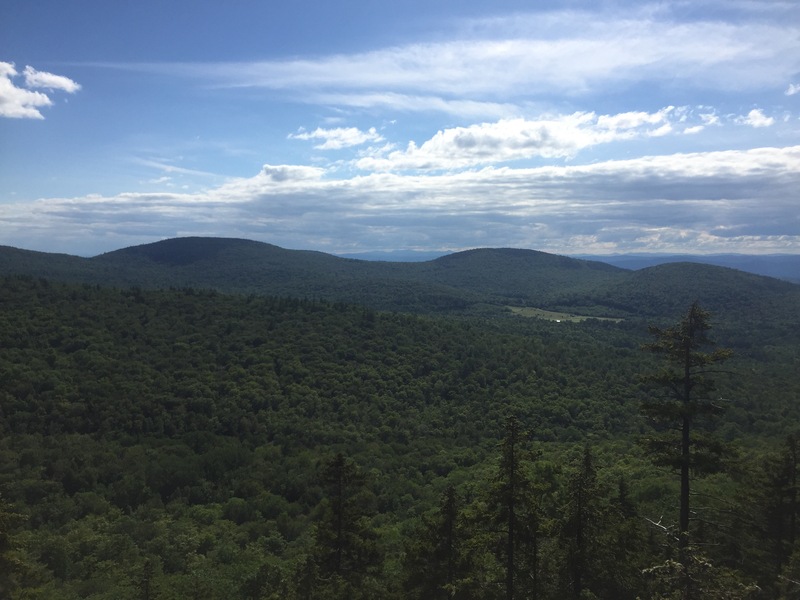 We continued on up Mount Mist, and then down into Glencliff, NH, the unofficial base of the White Mountains. 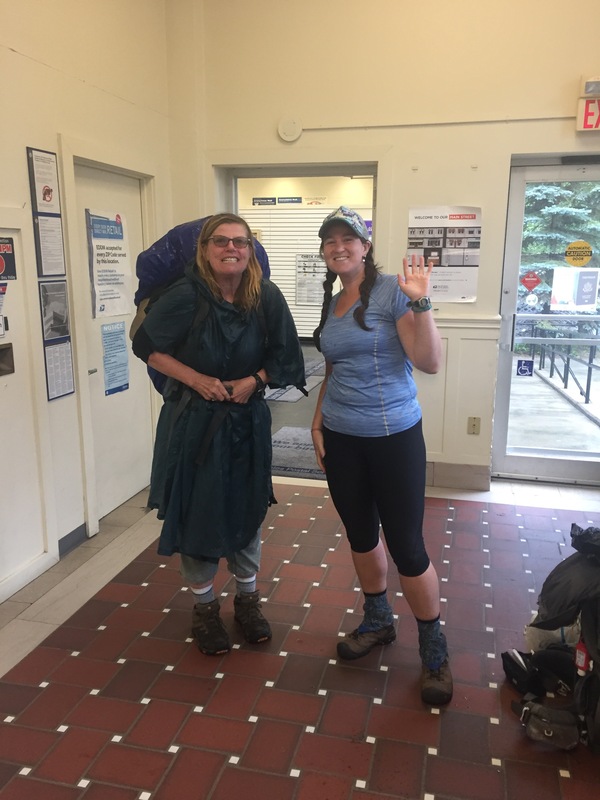 At the Hikers Welcome Hostel was our Trail family, Jaws & co, Rambo, Cousin Eddy, Einstein, Cheese, Martin, Squire, Stretch, Remix, O2, Hunter, Ghost Hiker, and Midnight Chocolate. 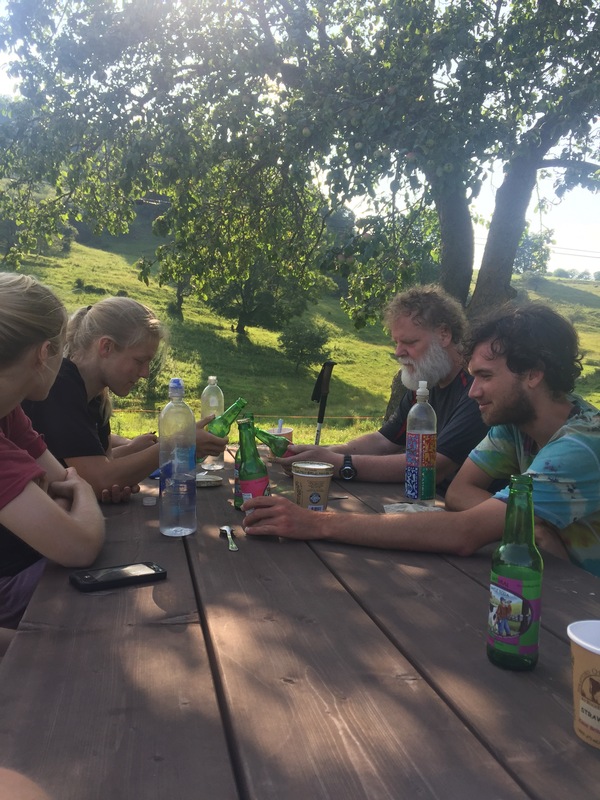 It was a fun, social evening as we all ate dinner together, talked about the trail, passed around a guitar, and played some card games. 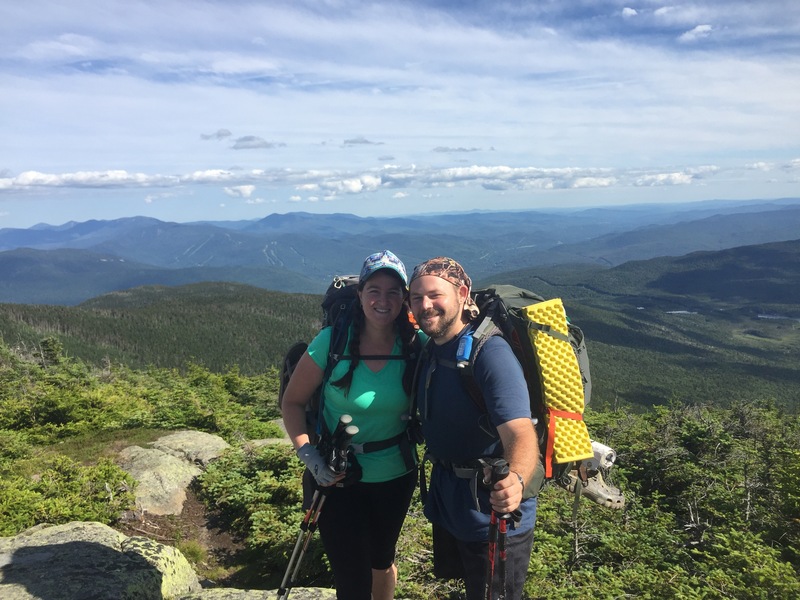 And then just like that we were in the famous White Mountains, much talked about among thru-hikers as the most challenging yet rewarding part of the whole AT. 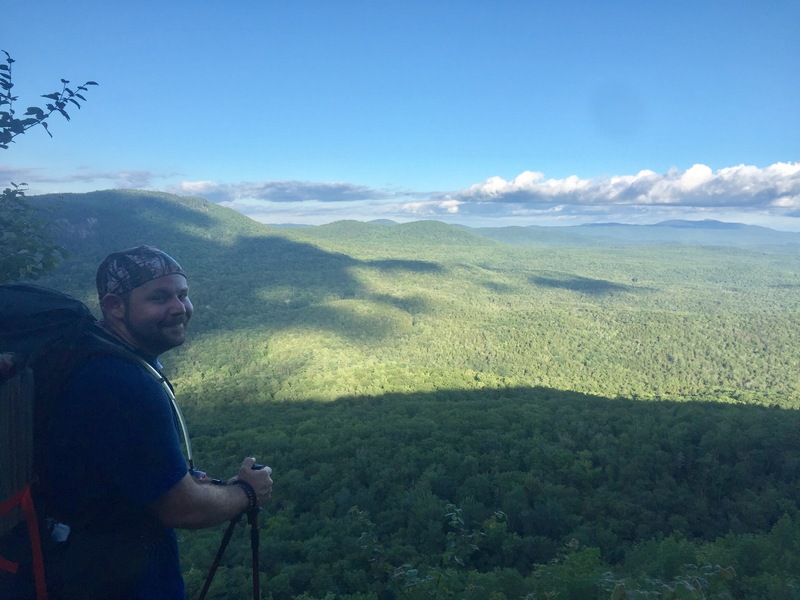 The peaks here are all above 4,000 feet in elevation, making everything from West Virginia to Vermont look like small hills. Good thing we’ve spent the last 10 weeks training our legs! 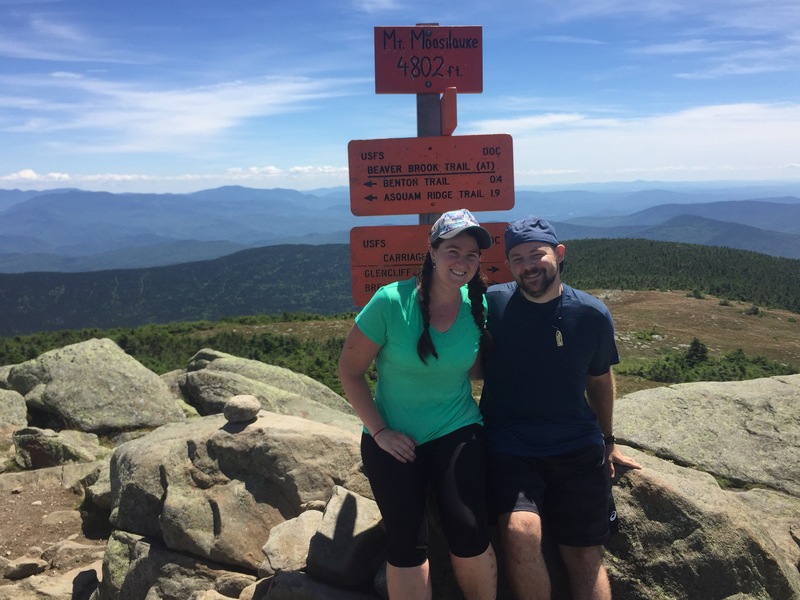 Mount Moosilauke was the first of our White Mountain challenges. Just imagine putting your StairMaster on the most difficult level, adding 35 lbs of resistance, and going for about 2.5 hours. But boy, was it worth it. 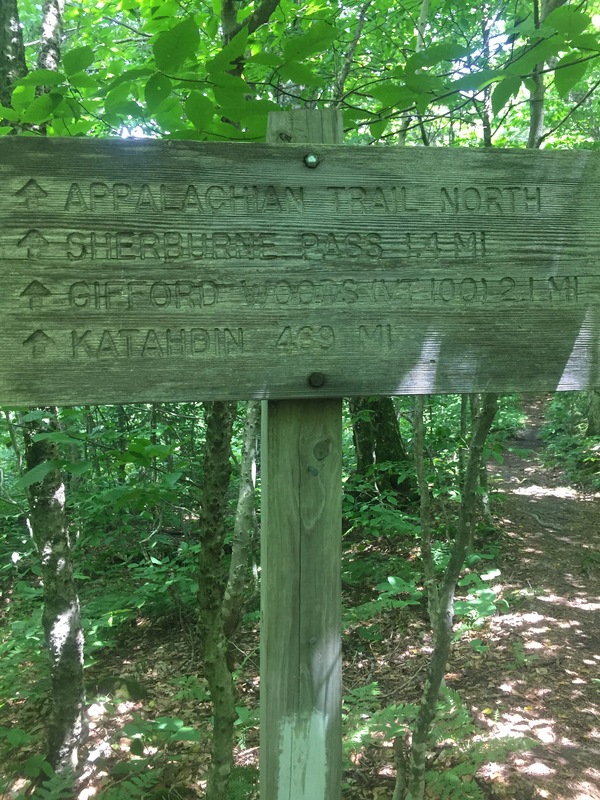 The trail was covered with a delicate green moss, car noise was replaced by birdsong and the wind, and the trees started to get shorter the higher we went. And then we were at the summit, feeling like we were on top of the world! We were joined by The Rock, Squire, Stretch, and Remix, and spent lunch playing cards with each other in the clouds! 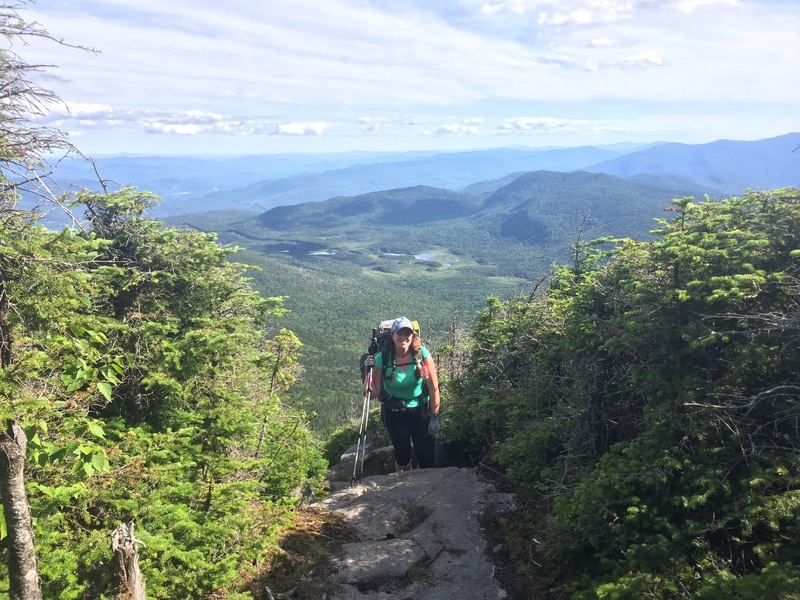 The other side of Mount Moosilauke has what is known as the steepest mile on the AT. And we were going down. Next to a waterfall. Although definitely a cool and memorable experience, we were sure to take our sweet time, so as not to fall down a nearly vertical rock wall! We ended the day at a nice little stealth campsite. The nights were stating to get chilly, so Chris and The Rock built a fire. We cooked and relaxed by the warm flames before letting sleep overtake us. In the morning we were joined by Squire, Stretch, and Remix for the climb up Mount Wolf. 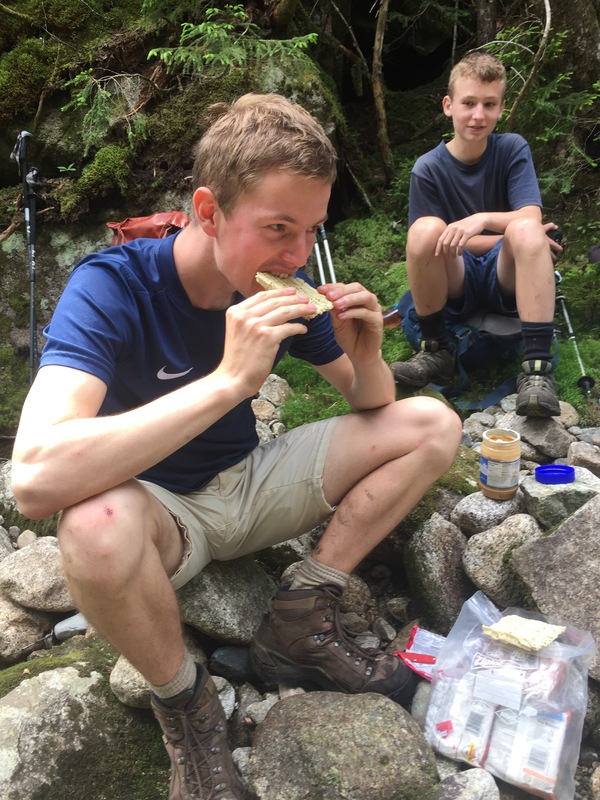 We ate lunch by a waterfall where The Rock decided to try a peanut butter/ramen sandwich. Ahh, trail food! 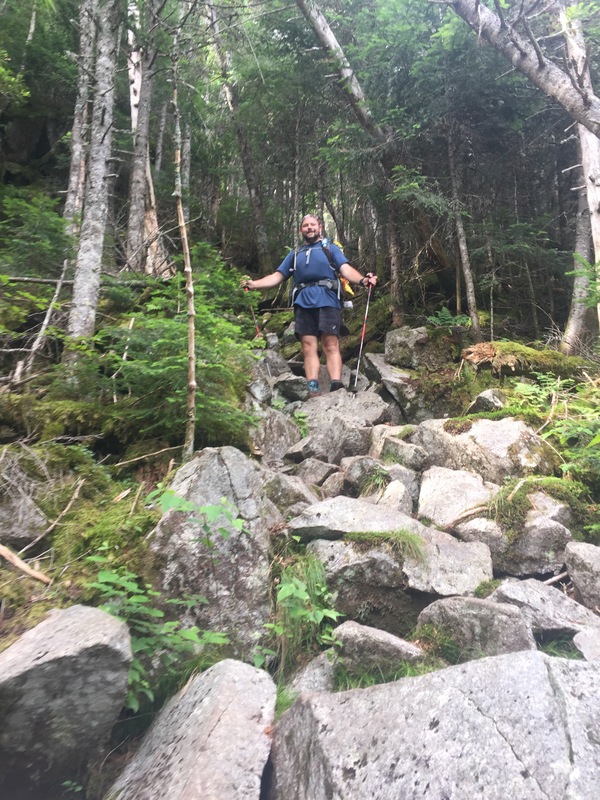 The next peak, Mount Kinsman was an afternoon long boulder scramble, rising 2,000 feet over 2 miles. I never knew I could learn so much about rock climbing from hiking! 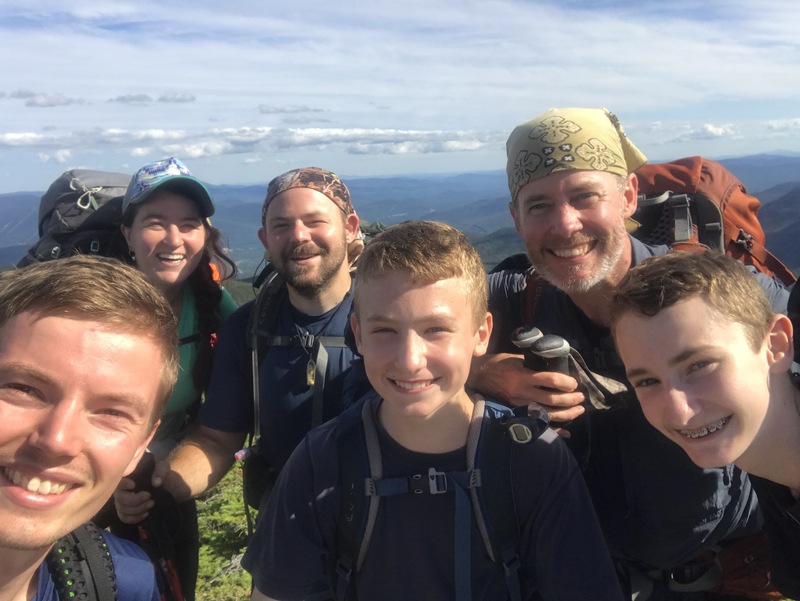 At the summit we took selfies with our “tramily.” It was so much fun to hike with the boys. Their young enthusiasm was infectious and made the day seem a lot shorter! Although we had planned to go further, we were running out of daylight, so we headed for the Kinsman Pond Shelter. 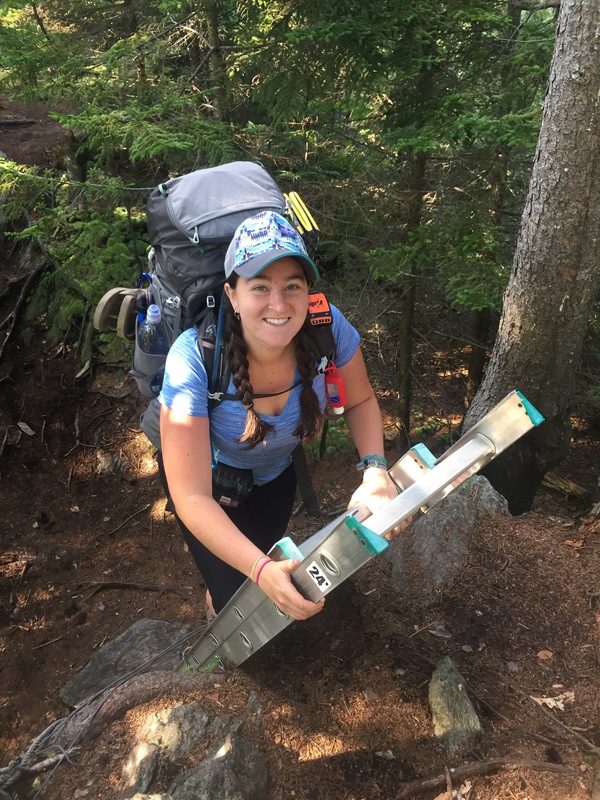 Being a Saturday, the shelter was full of dayhikers who quickly learned that personal sleeping space doesn’t exist when there are tired thru-hikers. We ended the night with another round of cards before squishing in with the 12 other people. Mmm, toasty! Which brings us to this morning. 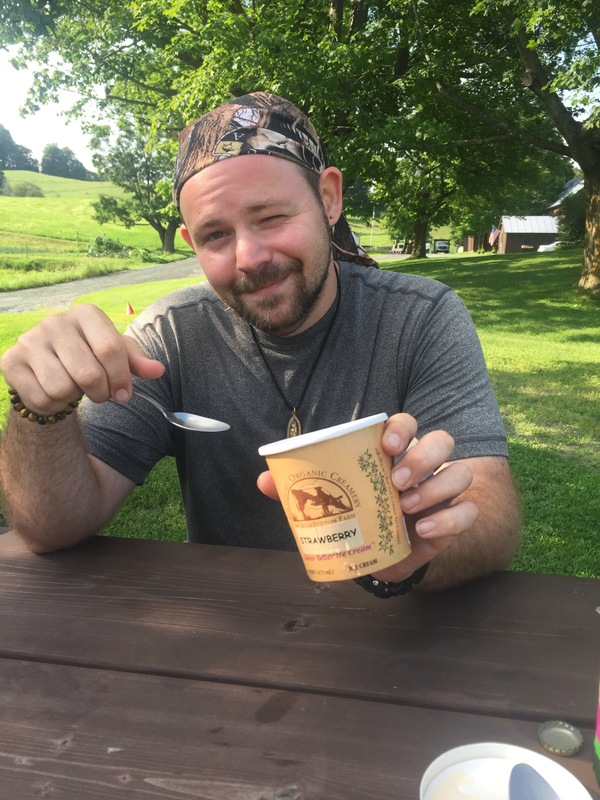 Our little Tramily ate breakfast and drank coffee together in the crisp morning air before heading down the rest of the mountain. 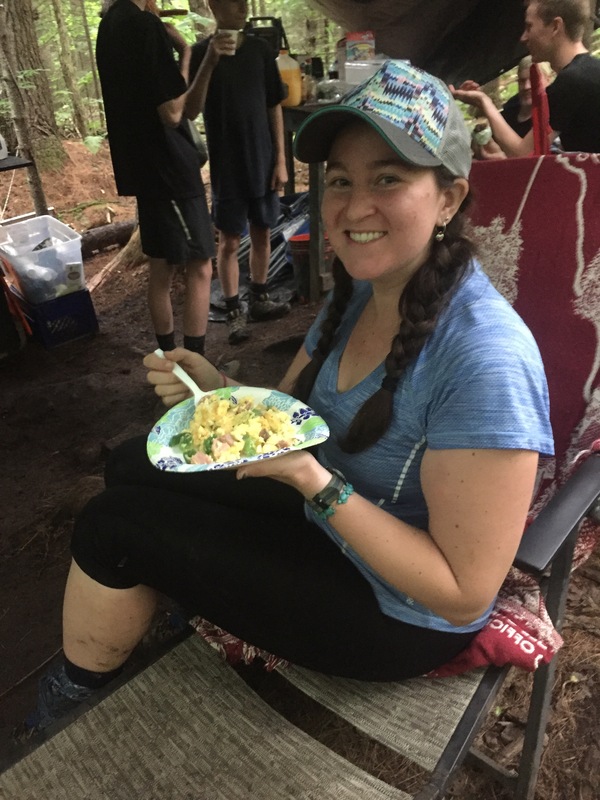 Spurring us on was the rumor that we could get free leftovers at The Lost Pond Hut, a cabin run and maintained by the Appalachian Mountain Club. We made it in time to score some Second Breakfast…eggs, oatmeal, and steak! Yum! It was a wonderful farewell to our Tramily, as we sadly had to split up. Chris, The Rock, and I were headed into town to resupply our food while Squire, Stretch, and Remix were continuing on up the trail. We hope to see them again soon! 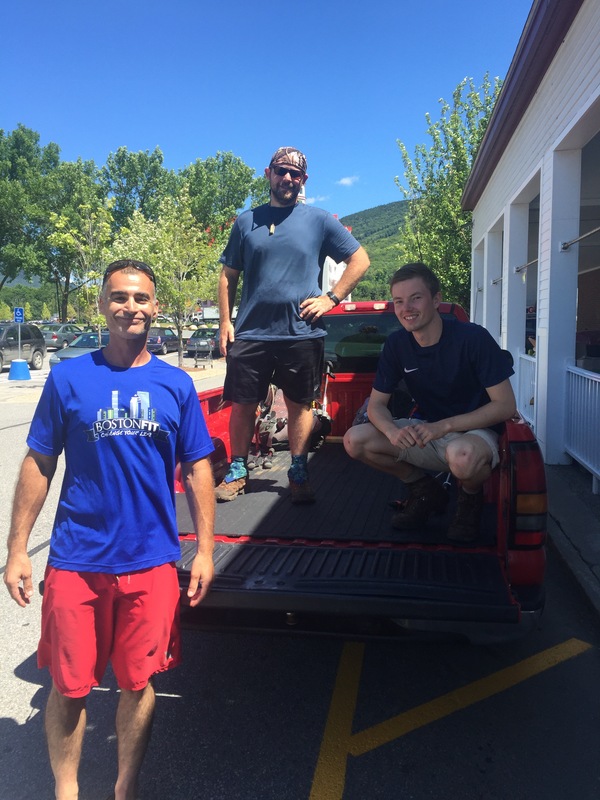 We end this part of the saga with a fun hitchhike into Lincoln, NH. Our ride, Sean, only had room for me in the truck, so Chris and The Rock enjoyed some fresh air in the open truck bed! 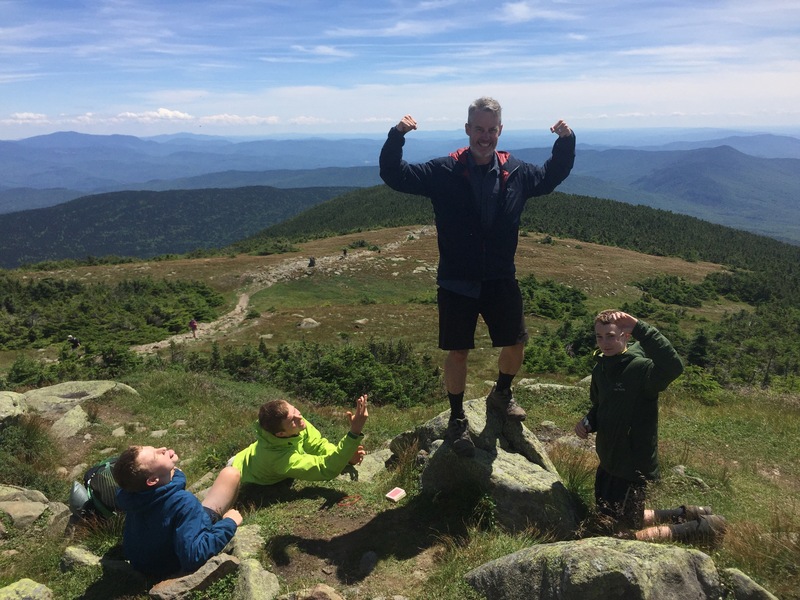 Tomorrow we continue our journey with the ascent up Mount LaFayette. Onwards and upwards! Fantastic Post, Keep Truckin it’s awesome ….